Winter is coming. If you rock a killer snowmobile to supplement your two-wheeled riding season, prepare for the inclement weather with these updates to Klim’s Snow apparel line. 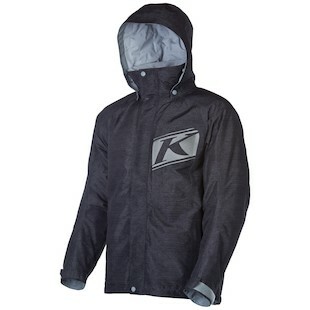 First up is the Klim Keweenaw Parka, redesigned for 2013-2014 and headlining Klim’s line of ultra-cold weather gear. High quality name brand components come together on this jacket. The waterproofing is taken care of by a Gore-Tex shell, insulation is provided by Thinsulate, abrasion resistance comes courtesy of Cordua in high wear areas, reflectivity is handled by Scotchlite, and YKK zippers pull the jacket together and keep it that way. If doing mad backflips on your snowmobile works up a sweat, the Keweenaw has 2 direct pit vents with an interior storm flap and 1 horizontal back exhaust vent. Just for safety, Klim also includes a D-ring to attach the kill switch too. That Thinsulate liner is quilted on the inside for super plush feel, and there is a snow dust skirt to keep the fresh pow out of your chest bro. The cuffs are adjustable and have internal hand gaiters, the collar is fleece-lined for comfort, there are 4 internal and 4 external pockets, and all exterior zippers are water resistant. 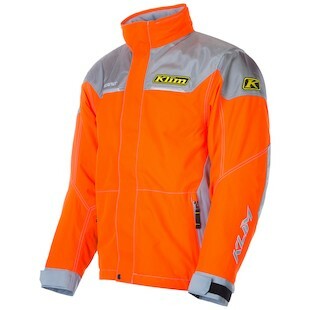 Next up is the Klim Klimate Parka, the Keweenaw’s younger brother, and a cruiser jacket for snowmobiles. The Gore-Tex waterproof shell covers a 200 gram Thinsulate thermal liner featuring the same comfort-quilted inner liner. Two pit zips with interior storm flaps handle the brunt of ventilation. The Klimate has 2 external and 4 internal pockets, comes with a fleece-lined collar as well, and adjustable cuffs. Cordura is used in high wear areas, the sleeves and elbows are articulated for added comfort, and the breathability of Gore-Tex expels heat and moisture for all day snow-shredding comfort. 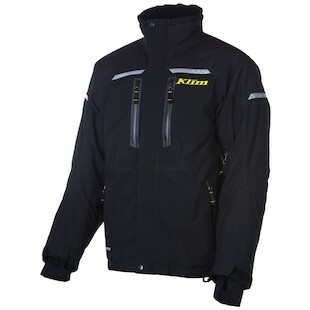 Last but not least we have the Klim Impulse Parka. The Impulse uses 100 grams of Thinsulate insulation underneath its Gore-Tex shell. The Impulse combines a snow dust skirt with the quilted comfort liner and is the only one of the three to come with a hood. Ventilation is handled by the staple dual pit vents with storm flaps, but is boosted by the addition of 2 additional ventilation ports. The cuffs, waist, and hood are all adjustable to fit properly. Each of these foul-weather ready insulated jackets comes with a matching pant. The construction of each corresponds to its matching jacket, but each one is Gore-Tex Guaranteed waterproof and Thinsulate insulated. The Keweenaw Pant and the Klimate Pant both have bibs while the Impulse Pant is just a bib-less waist-high foul weather pant. Klimate builds upon the heavy-duty Nylon construction of the other 2 by incorporating Ballistic Nylon in the knees and shins. Both the Klimate and the Keweenaw use 200 grams of Thinsulate insulation and have full length side zips for maximum ventilation. The Impulse has slight articulation in the knees, and the Keweenaw & Klimate have articulation in the waist, knees, and seat. The quilted comfort liner found in the jackets migrates down to the inside of these pants as well. Quality gear and protection is just as important on snow as it is on the street. Without proper waterproofing and insulation, how are you going to enjoy that sweet fresh pow? Whether you are herding reindeer in Finland, volunteering as a camera vehicle for the Iditarod, racing across a frozen lake, or just puttering around your backyard, gear up for winter with Klim. Prepare yourselves, snowmobiles are coming.